One of the surest rules for the touring musician: Hurry up and wait! 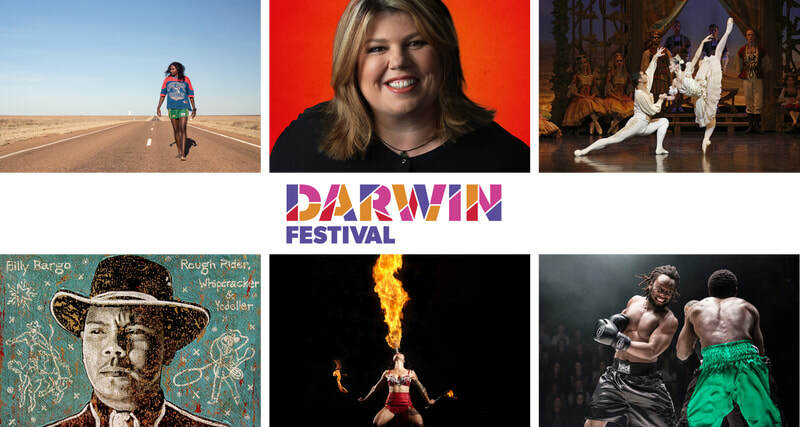 Richard Watts wrote of the show in Performing ArtsHub: “As dusk gathers, the sinking sun gilds the treetops which ring the grassy slopes of Darwin Amphitheatre, painting them in vivid emerald shades against the darkening sky. Beneath their boughs hang giant paper lanterns, illuminating a festive crowd gathered on picnic blankets and folding chairs. 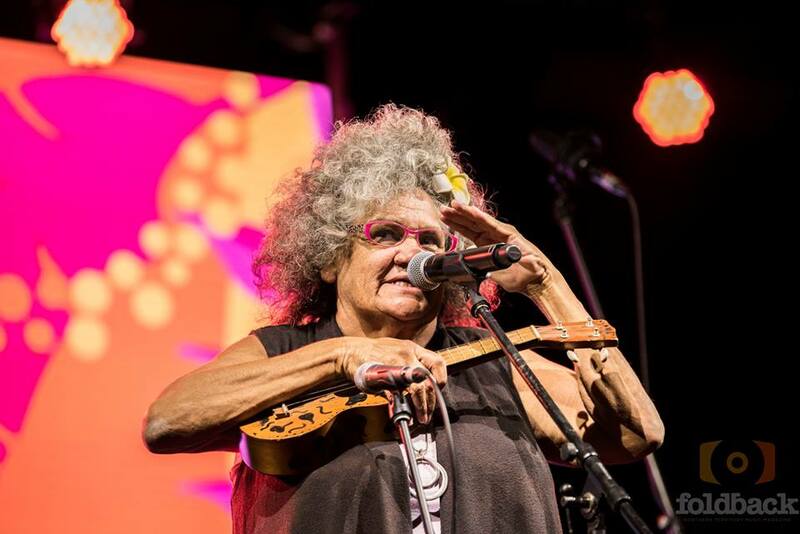 The air is soft and warm… in the words of Larrakia singer Ali Mills, who takes to the stage with a ukulele to sing ‘Adelaide River’, the Darwin Festival’s free opening night concert is a rare moment where ‘you and me will meet’. 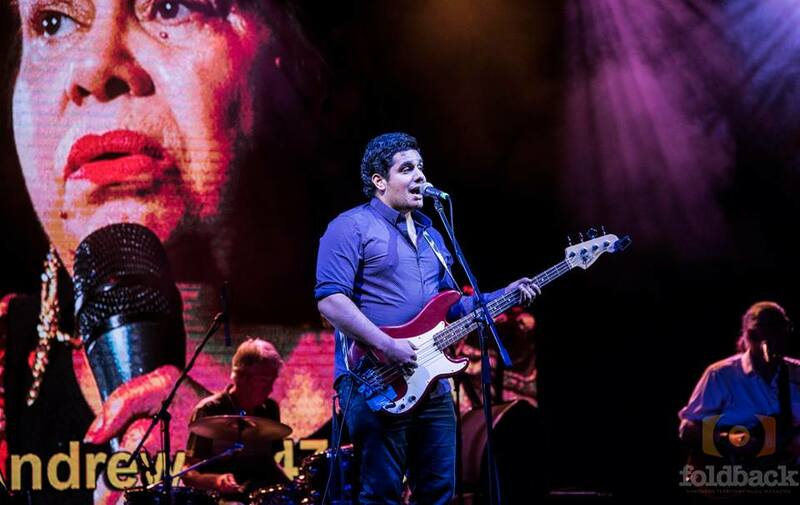 “Some of the founders of Aboriginal country music are no longer with us, some having passed on since earlier iterations of the concert which is based on the book and documentary of the same name by Clinton Walker. Those who are still with us, such as L. J Hill, are frail and occasionally forgetful, but Hill is still capable of passion despite his weakening voice, as he clearly demonstrates on ‘Pretty Bird Tree’ – once he is reminded which song he is supposed to sing. 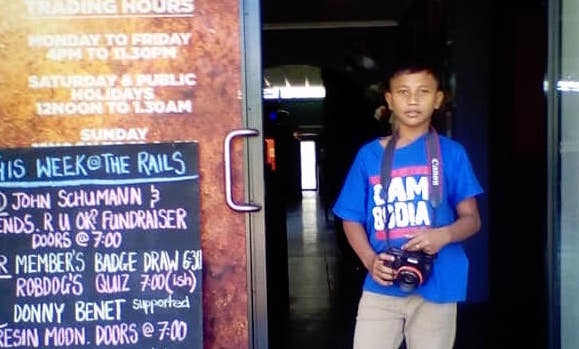 “Instead, we hear from the children and grandchildren of those groundbreaking artists, and from other artists they have inspired, while video projections at the back of the stage give us glimpses of their original voices and songs. 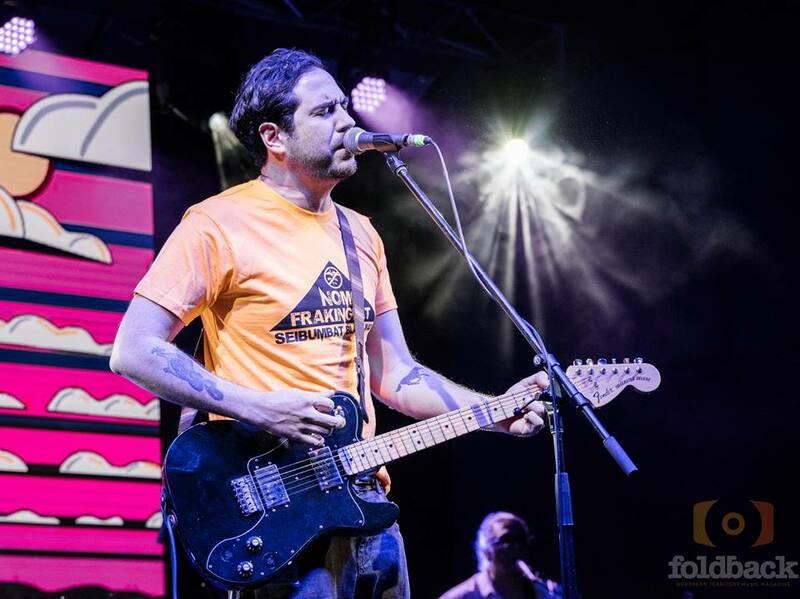 The performers are more than ably supported by the Backtrackers, a tight and accomplished backing band who drive the night forward with gusto and, when the occasion demands it, beautifully shaded intensity. Alex Collins wrote in themusic.com.au: "Many of the songs featured throughout the night were sparse in their original form, but were filled out by a killer house band in the Backtrackers. 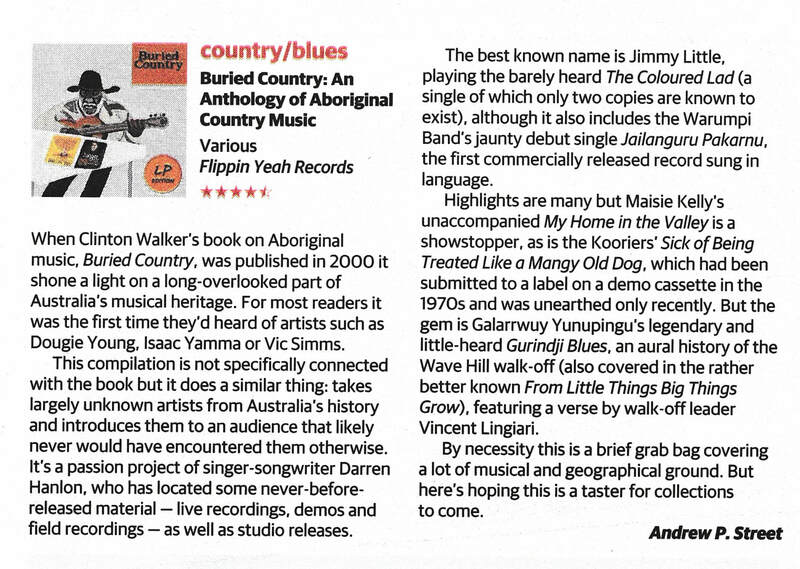 Buddy Knox's take on Black Allan Barker's ‘Run Dingo Run’ is a muscular brute of a blues number that bristles with attitude. The old cliche says that country music is nothing more than three chords and the truth, and there's plenty of truth when Leah Flanagan thanks Santos for sponsoring the opening night but adds that it won't buy her silence as she speaks out against opening the Territory up to fracking. ​Said Leah of the stand she took: “Yes I was nervous but I believe if you are given a platform to connect with people, it is important to do the right thing. After the loss of an important figure across this country who fought to keep coal seam gas mining off her country and out of the NT, I had to honor the legacy of the great Alice Eather and make my voice count. Fracking is poison and the NT government has no right to sell off more than half of our land mass to a foreign company for short term, short sighted 'profits'. Please, everyone, lets be noisy and get in their faces. They've lifted the ban but we can still stop them from taking things further. We just have to be dedicated and stop being complacent. No-one is going to do this for us. We have to do it for our land and for the future of our families. DON'T FRACK THE NT! On the Saturday night back at the Amphitheatre for the NIMAs, Warren H. Williams introduced Roger Knox to get his Lifetime gong. He said, "Tonight’s inductee to the NIMAs' Hall of Fame is country through and through. Our families have grown up and played music together over the decades, so it’s a proud moment for me tonight to stand here and talk about my friend. He grew up in the missions of outback New South Wales where Sunday school gospel was his first exposure to music and singing. His parents and grandparents participated in church choirs and the love of music, and that rubbed off onto his talent; he was a handsome teenager, he had a reputation for snappy dressing and big hair – whaddya reckon?! – fancy moves gave him the nickname the Black Elvis! Roger joined the legendary Brian Young show in the 80s and that gave him an excellent grounding in bush touring, developing his stagecraft and songwriting skills, leading to a lifetime of entertaining his adoring audience. 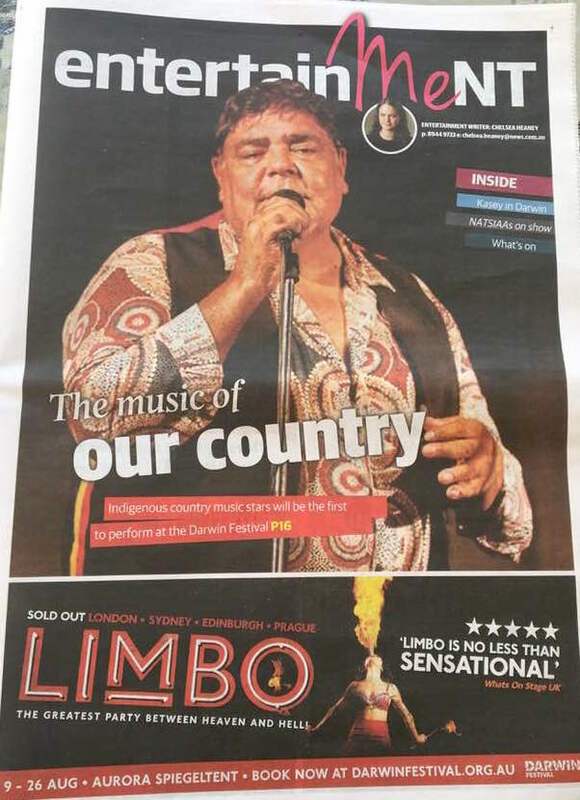 "He and his family have been the backbone of country music in Tamworth for decades, encouraging young Aboriginal people. This man and his band of brothers have earned a huge reputation from campfires to the world stage. 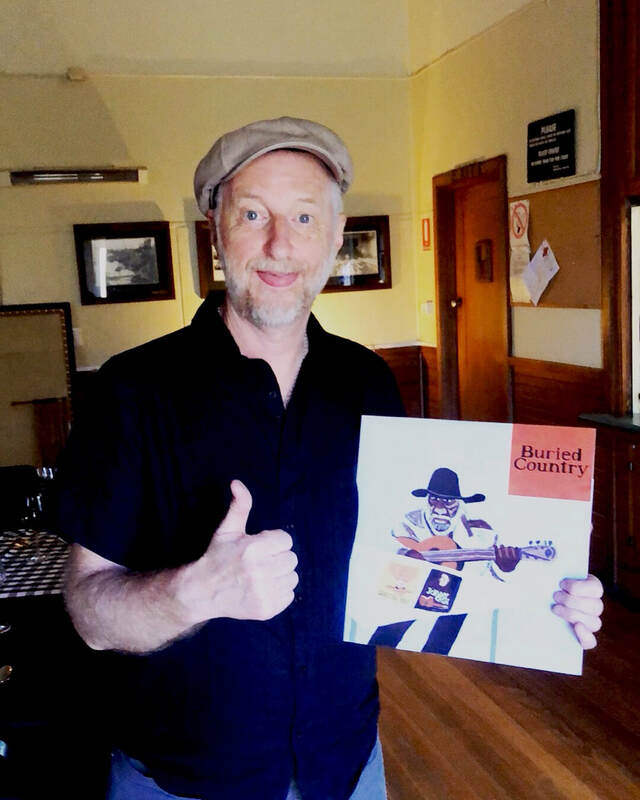 The original publication of the Buried Country book and compilation album in 2000 bought wider recognition of the featured artists, and Roger’s solo albums became in much demand, and in festivals all around Australia. 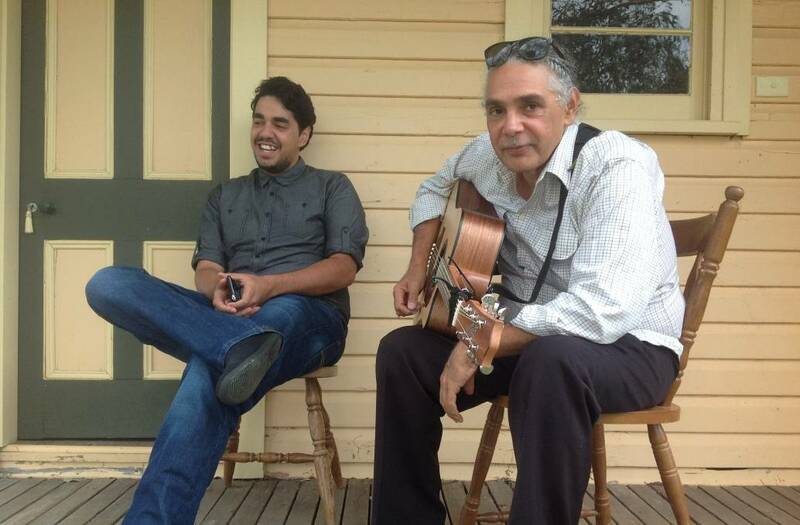 His smooth, strong vocals and his songs proved popular outside traditional country music circles and got high rotation at CAAMA radio [which Warren should well know, since he was the DJ spinning ’em!]. So, rightly, Roger has been nominated and won many industry awards. 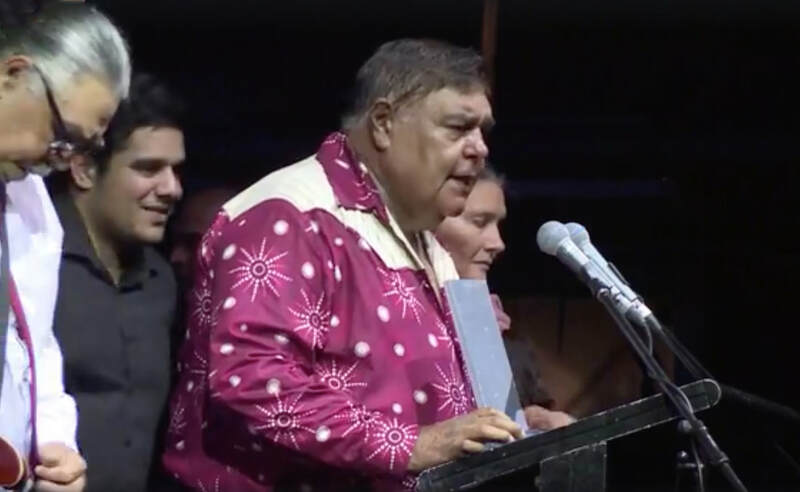 I have shared the stage with this man many times and I am so proud to be handing him this lifetime achievement award tonight – give it up for Roger Knox…"
After the customary acknowledgements and a greeting in his own Kamilaroi language, Roger said, “It’s a great privilege to be here tonight to receive this award. Someone said to me it’s been a long time comin’ but… we got a long way to go! I’d like to thank the organisers here tonight, the NIMA people, for such a deadly honor. When I look back over the years I’m so grateful to all the people who’ve helped me, there was so many people who have lifted me up, when times were hard – and they were really hard sometimes through them early years, especially comin’ from an area where I come from, it was really hard as a black musician to try and get things done and to move forward, to me I’m just a humble blackfella from a little mission called Toomelah… nearest town is a place called Goondiwindi, but I wouldn’t like to say too much about that… the media has recently portrayed Toomelah as a fourth-world community… [but] I’m here today, what I am, because of my mother and my father and my brothers and my sisters, and my children, and I’d like to thank their mother Vivien, may she rest in peace… and I’d like thank Buddy, who’s at my side here, I had to drag him out of school! coax him.. I’d like to acknowledge my earlier heroes, like Uncle Col Hardy, who got me up out of my sickbed… a great hero of mine Uncle Dougie Young… and Uncle Lyle Munro… and Uncle Charlie Duncan, who taught me or introduced me to music, he made me work towards bein’ somebody, because I am somebody… they all encouraged me and helped me to realize and respect and continue the important cultural tradition of giving credit to other songlines, and sharing them across our country… many thanks to my late friend and a great man, Eric Allen… and thanks to a lady here who has been with me, she is my great friend, supported me and believed in me in the last few years, Nic… I’d also like to make mention of Enrec Studios in Tamworth because during those times we couldn’t get our songs out there, and it was the people from Enrec who give us this opportunity… I’d like to thank another great fried, Jon Langford, who helped me tour through Canada and the USA… and maybe some of you mob were here the other night for the Buried Country show, Buried Country tells the true story of our mob’s country music, so thank you, Mary… I’d like thank all my mob across country… you know sometimes you stumble, sometimes you fall, but I believe you never walk alone… my music has taken me from Toomelah to some of the great stages of the world, it hasn’t been an easy path, but I’ve played in many prisons, I know what life is like for some of my brothers and sisters, and my message is simple, love one another, love yourself, and if you're going to get anything, get understanding." 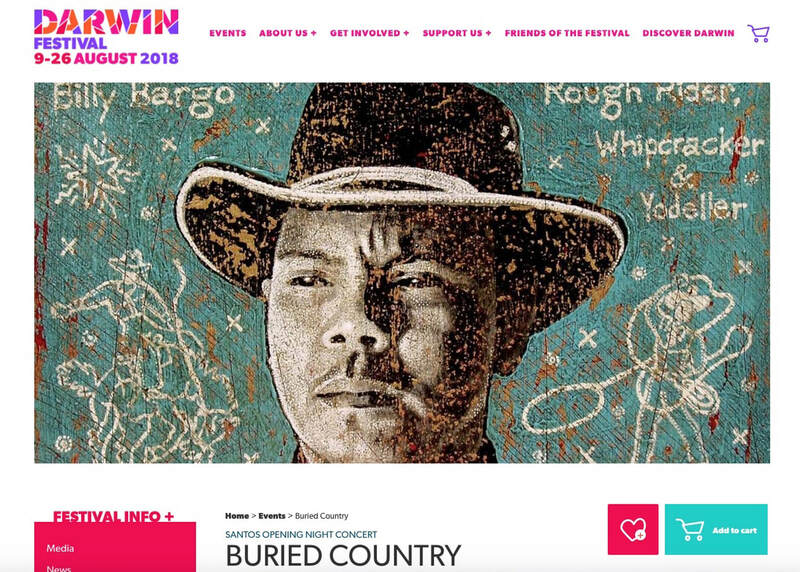 ​The Buried Country mob all started trickling in to Darwin today ahead of our show on Thursday night, August 9, to open this year’s festival there. 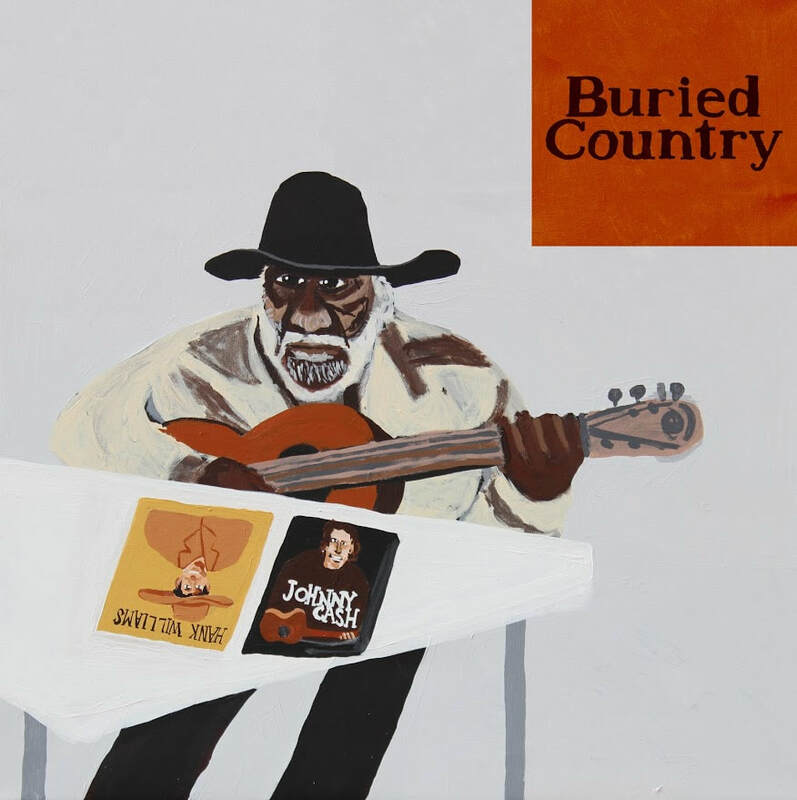 Buried Country will appear, for free, at the Santos Opening Night Concert at the Darwin Amphitheatre, starting at 7pm. 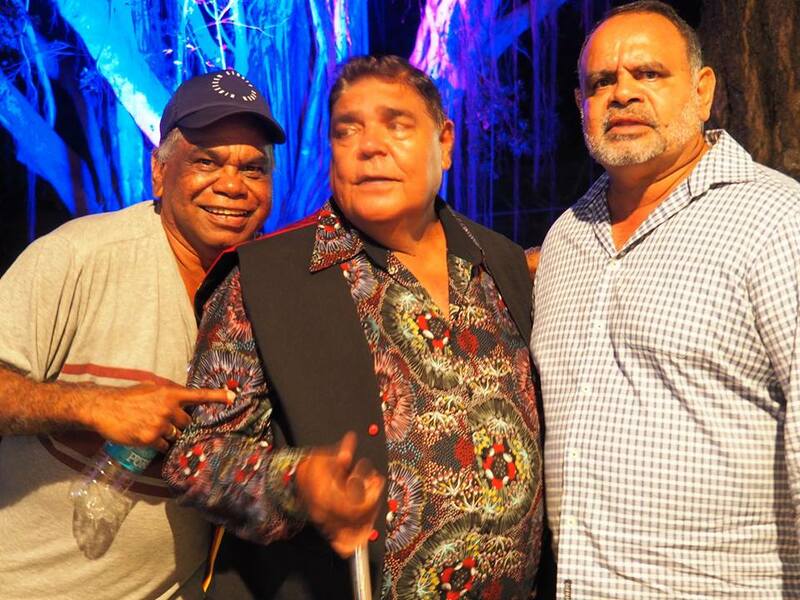 It is a special event for the festival and the week will be a special one for Buried Country too, with cast-member Roger Knox lined up to be inducted into the NIMA’s Hall of Fame at the Awards’ ceremony at the Amphitheatre on Saturday night, August 11. 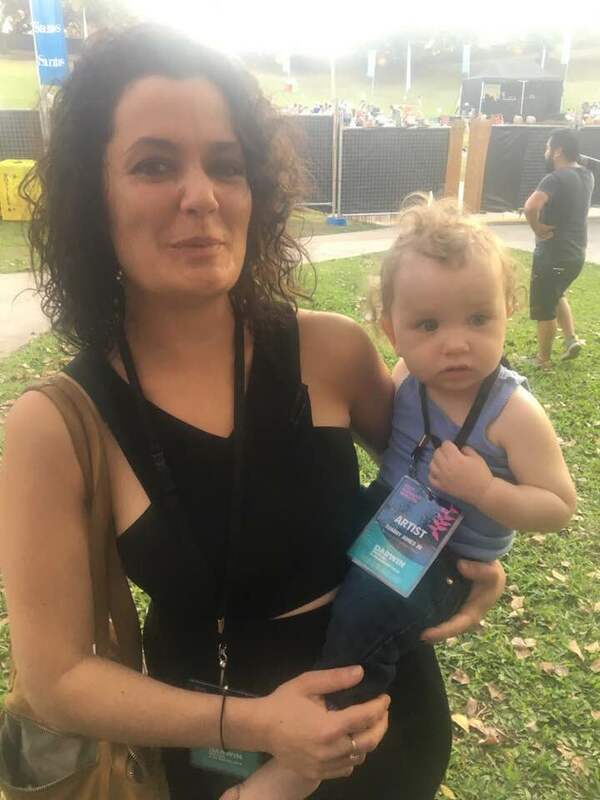 ​For Buried Country’s Leah Flanagan, the gig is a homecoming, and she is relishing showing off her beautiful new baby boy Tuco to family and friends. 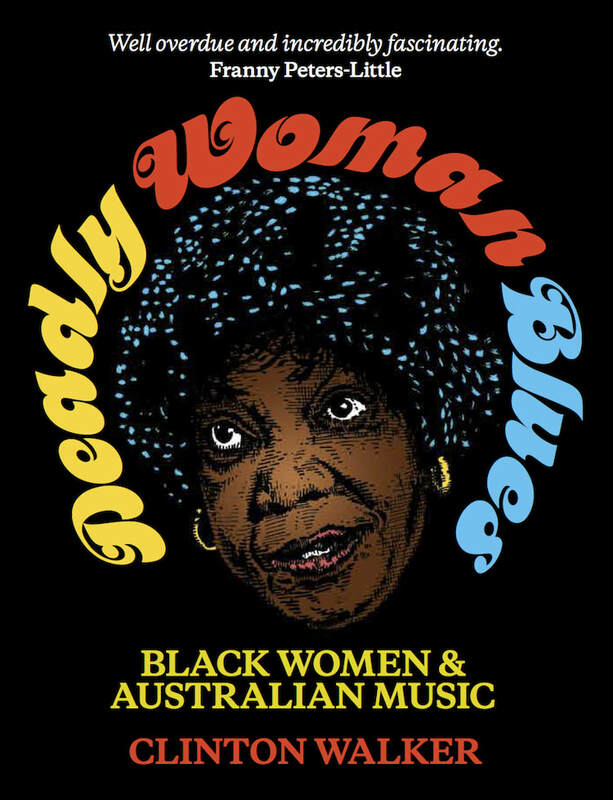 Leah’s rendition of Bob Randall’s “Brown Skin Baby” is always one of the show’s highlights, and will have further resonance in Darwin where Randall first unveiled the song around sixty years ago in the late 1960s. In the absence of cast regular Franny Peters-Little, the Darwin show will also boast a special guest, Eleanor Dixon. 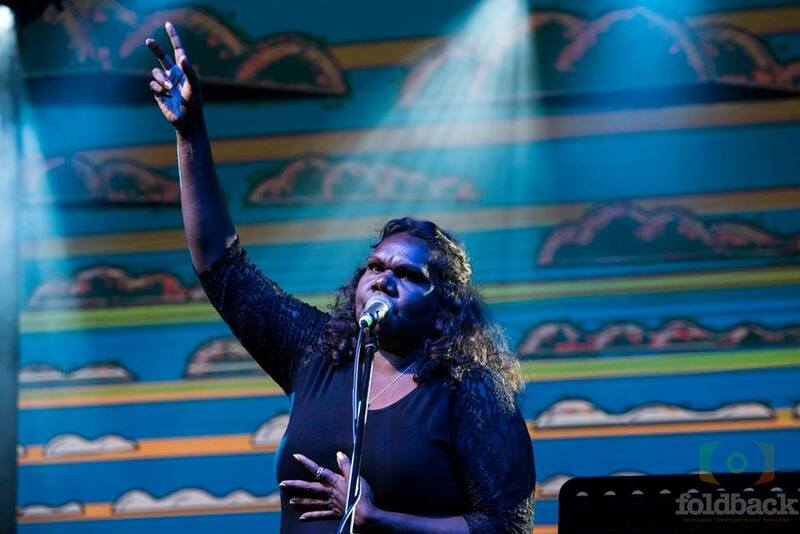 Elly likely needs little introduction especially to Territorians, with her esteemed work over the years with Rayella, her band with her father Ray Dixon, and her band Kardajala Kirri-Darra, who’ve lately set the Australian music scene on its ear. 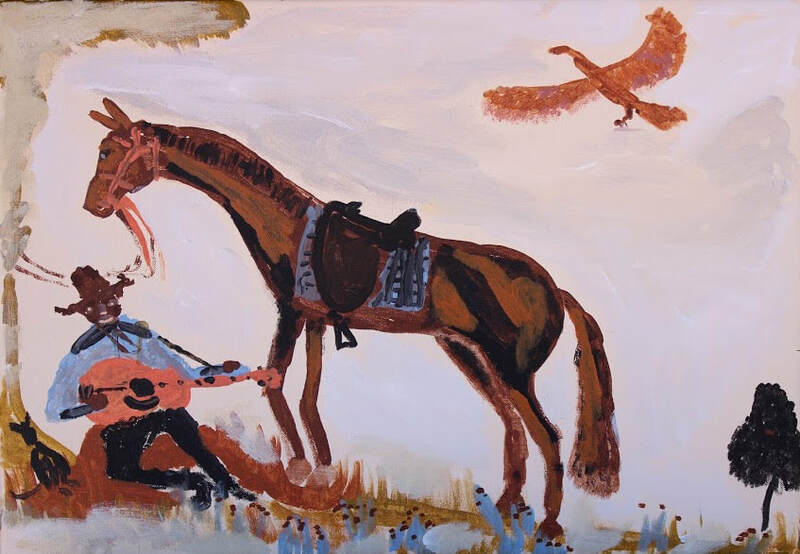 With Buried Country, Eleanor will put her own spin on one of the songs that Franny usually sings in the show, her father Jimmy Little’s “Blacktracker,” and she will sing one of her own songs, which – we hope! – the band is furiously rehearsing even as we speak. For Roger Knox, to be inducted into the NIMA Hall of Fame, is only fitting if not overdue. But then the late Auriel Andrew still wants to be acknowledged in such a way too, and the ARIA Hall of Fame has a lot of catching up to do. Roger is a living legend and he has been a lynch-pin in the Buried Country stageshow since its inception a few years ago. Even for all the duress that such full-scale touring can impose on especially elders, his commitment and deep soul has never wavered. 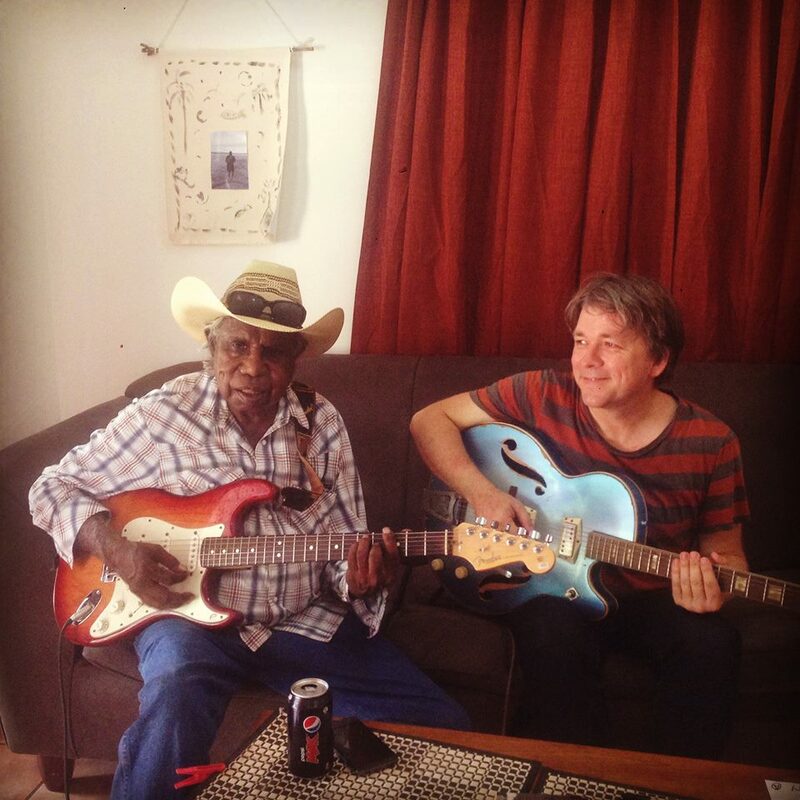 Roger will join other such Hall of Famers as Ali Mills, Jimmy Little, Seaman Dan, Archie Roach, Vic Simms and Kutcha Edwards, and on the night he will perform a few songs alongside other showcase performances by 2018 NIMA nominees like the Baker Boys, Busby Marou, Kasey Chambers with Alan Pigram, Alice Skye and others. He will then, later this year, be the subject of an exhibition at the new Australian Music Vault at the Arts Centre in Melbourne, which will display artefacts and show films from his 40-year long career. A national tour with Jon Langford is also in the offing. And so this album is not just yet another dimension to the seemingly unstoppable Buried Country juggernaut but, with the inclusion of rare tracks like the never-before re-released “Give the Coloured Lad a Chance” by Jimmy Little, and the never-ever released cassette demo of the Kooriers’ “Sick of Being Treated Like a Mangy Old Dog,” and complete with its accompanying 36-page booklet, it is a whole other entity in its own right. 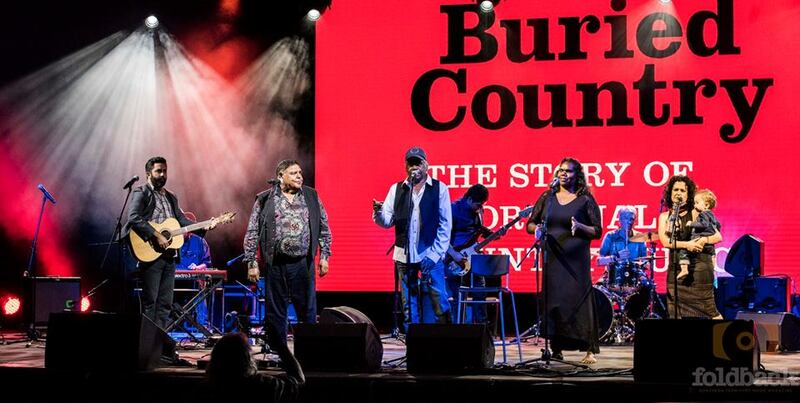 … to the Territory where so much music and some of our stars – Warren H. Williams and Leah Flanagan – come from, but Buried Country: Live in Concert is delighted to be able to announce we will be playing opening night at the up-coming 2018 Darwin Festival in August. The show, which is free (! 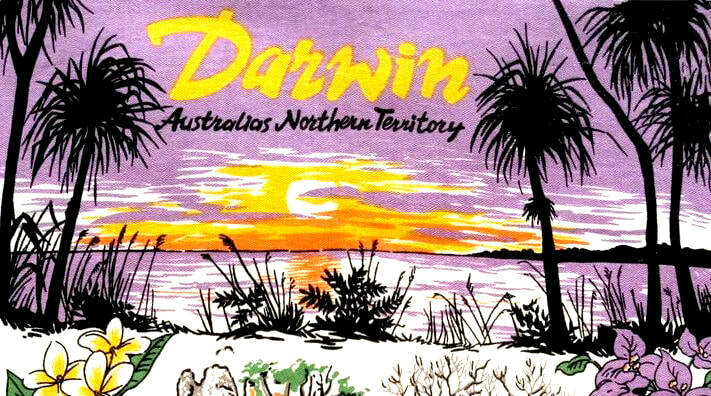 ), will be on at the Darwin Amphitheatre on Thursday, August 9, at 7pm. For more details go here or click through the image above. ​A few years ago, I was asked to write a letter in support of an application for a visa to get into America that was being being made by Buried Country star Roger Knox. Roger had initially been knocked back on the grounds that he was a terrorist, or an artist of insufficient repute for the US to let him in or something like that. Without ever saying, well, he’s a black man, we don’t any more of them than we’ve already got. Anyway thankfully something worked and Roger got his visa and went on to complete his album Stranger in my Country with Jon Langford in Chicago. 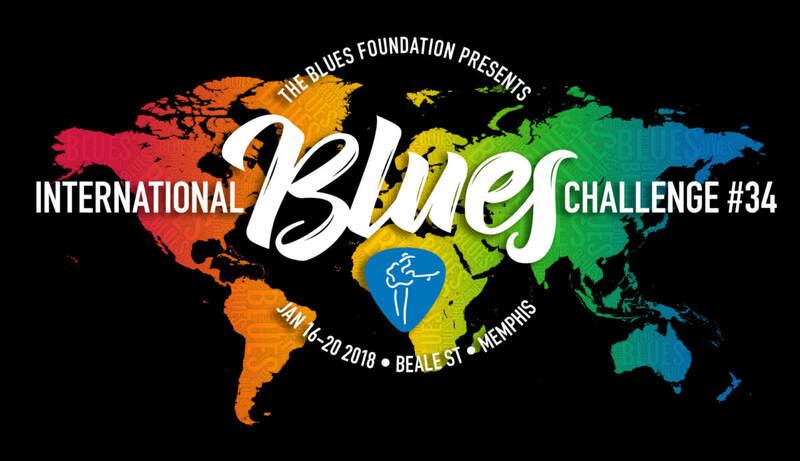 I’ve just done a similar thing for Roger’s son Buddy, who is a fellow cast member of the Buried Country roadshow, to help push through the general approvals for Buddy and his son Goori to go to the US to compete in the 2018 International Blues Challenge in Memphis in January. ​I told whosoever it may concern that I first met Buddy when he was still just a teenager playing guitar in his father Roger’s Euraba Band in the early 1980s, when I was a young music journalist writing about Roger, that I’ve known him for that long, and that I could not vouch more earnestly for him as both a friend and musician. I told them, I can say unequivocably what a fine, fine musician Buddy is, and a complete professional at it, and that it’s a measure of his talent and initiative that he can cross so readily between genres like country and blues the way he goes from Buried Country or the Euraba Band with which he still still plays to this duo with Goori. It is in fact an absolute delight for me to see Buddy continuing his family tradition in music, and for Goori to be doing so well as his partner in this endeavor and gaining so much for the experience. Buddy and Goori will make fine ambassadors for Australia and especially Aboriginal Australia at the challenge in Memphis and though I may not know who their competitors are, I share their confidence that they will give it a real good shake. Go, Buddy, go! ​Delighted to be able to announce, just confirmed, the next Buried Country: Live in Concert gig will be at the Tamworth Country Music Festival in January 2018. Co-presented by the Jimmy Little Foundation, Buried Country will appear in concert at the Capitol Theatre in Tammy on Sunday, January 21. ​Perhaps it’s opportune to note here now too that in attendance at that Enrec session was Iain Shedden, a long-time supporter and great friend of BC who has sadly just passed away. Sheddy went off and wrote up in his Spin Doctor column in the Australian that our little invite-only event was one of the two best gigs he saw up at Tammy at that time, and we were all grateful for his support – he subsequently afforded us another major feature in the Australian – and we will miss him dearly. So there are all those good reasons and more that we are so happy to finally be returning to Australia’s home of country music, the ‘more’ being that it is a hometown gig at last for the Knox family members of the show – and that the date is a special milestone birthday for Franny too. 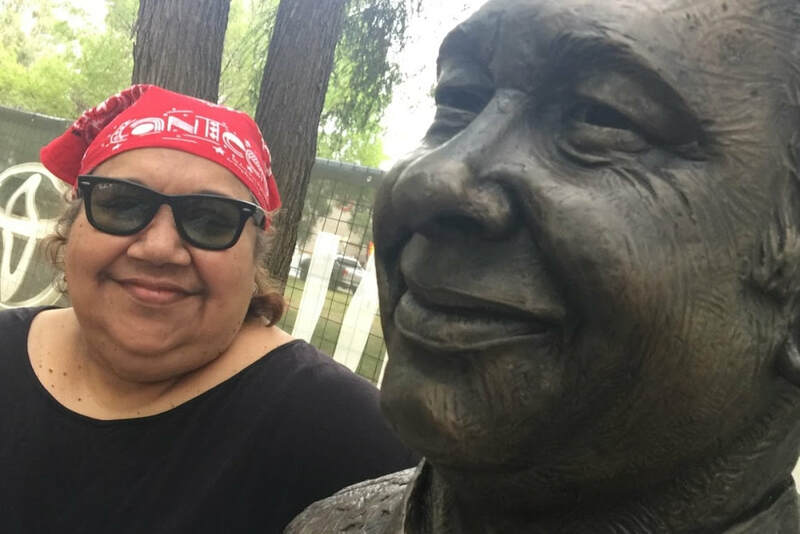 The Jimmy Little Foundation is a non-profit organisation that carries on its namesake’s dedication to the improvement of the quality of life and health of Indigenous Australians, and Buried Country is proud that it is proud to be co-presenting our Tammy show. We know that Franny, James Henry and the whole mob will do Jimmy and Marj proud - and we’ll do one for Sheddy too!